This month gallery nrc welcomes four talented local nature photographers. Nathaniel Coalson, Grant Collier, Kent Gunnufson and Monte Trumbull will explore the photographic medium with a combination of color and black/white photographs. Nathaniel Coalson is a Colorado-based professional photographer specializing in nature photography and abstract fine art photography. His work, which often features alternative processes and unusual materials, has received numerous awards and is held in private and corporate collections worldwide. He is the author of “Lightroom 2: Streamlining your Digital Photography Process” (Wiley, 2009) and will have copies of his book on hand during the opening reception. Grant Collier grew up in the foothills above Denver and spent much of his childhood exploring Colorado’s Rocky Mountains. Grant has continued exploring the Colorado wilderness, taking thousands of color landscape photographs. 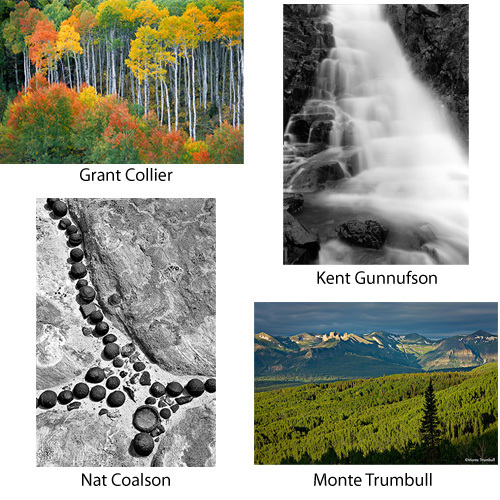 These images have been published in the books “Colorado: Moments in Time,” “Colorado’s Hidden Wonders,” “Colorado Wild,” and “Colorado’s San Juan Mountains.” Collier also produces a yearly Colorado wall calendar and his work has also been displayed in galleries throughout Colorado. His photographs have been featured in most of the major television stations and newspapers in Colorado and have been published in magazines across the United States and Europe. Kent Gunnufson is an award winning photographer, TV producer and film maker. He has been photographing the high country since the seventies resulting in Summit County’s first fine-art landscape book, TRACKING THE SNOWSHOE ITINERANT. He has been documenting mountain dwellers since 1982 and will soon complete a feature documentary to promote his ongoing series Life at 10,000 Feet. Monte Trumbull made the move to Buena Vista, Colorado in 2006 to pursue his passion for photographing nature. He strives to create images that allow the viewer to feel as if they were there to share the moment. He travels not only the state but the world to witness and capture nature’s ever-changing beauty. The Nature Photography Group Show runs from July 3, 2009 – August 4, 2009.